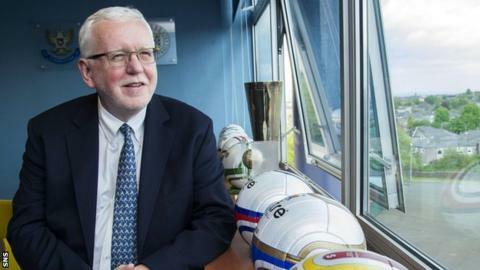 Scottish Premier League clubs have rejected amendments from the Scottish Football League to the top-tier's plan for restructuring the league system. And the SPL will plough ahead with its vision of the future by holding a formal vote of its 12 clubs within the next 10 days. The SFL had proposed that a greater share of funding should filter down to Second and Third Division clubs. But SPL chairman Ralph Topping said it was sticking to its own plan. That would involve a merger of the SPL and SFL to form a single league body and play-offs involving the 11th-placed club in the top-flight and three second-tier teams. Money would filter down from the SPL to First Division clubs to create a softer landing for relegated clubs in return for those in the top-flight having an increased chance of dropping to Division One. At present, only the club finishing last are relegated. SFL clubs wanted some of the money going to First Division clubs to filter further down to the levels below, but that was rejected by SPL clubs. "The SPL clubs to a man, and woman, round the table want to go to 'yes' and sign off on the changes, the 42-club proposal," said Topping. "They want to take it forward and are willing to commit themselves to that through written resolution, which is great news for the game. "The last meeting was a good one. You are always concerned that something's going to change in the interim. "I'm delighted to say we went round the table, person by person, and they were all behind the proposal." SFL clubs had also wanted one club from each of the bottom three divisions to be represented on the board of a new united league along with three top-flight clubs. However, the SPL is insisting on two second-tier clubs and one lower-league club joining the top-division representatives. SFL clubs are next due to meet on Thursday afternoon for the organisation's annual meeting and Topping remains hopeful that they will accept the SPL plan. "I take a perspective that says you'd have to have your head looked at to turn down extra money, wouldn't you?" he said. "You would really have to consider where is the SFL going to generate the funding we are providing for the professional game? Where is that going to come from? "Where is the management of the SFL going to generate that funding? "The SPL have said we will provide financial help to these professional clubs to stop that situation happening." Asked about the lower-league clubs' desire for a more equitable share of central income, Topping said: "We discussed that at length. "We should be looking for a single league body and we should be looking forward to generating cash for the game. "That's the focus of the SPL and something we believe can be delivered for next season, should be delivered for next season and must be delivered for next season. "And any attempt to delay developments until the next season, I don't think it's good for the game in Scotland, and people who might look at it that way, I think need to go away and stick their head in an ice bucket and think again." Topping stressed that the main issue was to prevent the financial crises that have struck clubs who were relegated from the top flight. Dunfermline Athletic went into administration this season after dropping out of the SPL and ended up suffering consecutive relegations after a points deduction. SFL clubs would likely be given 14 days notice of a formal vote, which would follow any SPL vote.